I remember the Fancy Shawl dances from my childhood: the beaded capes and intricately embroidered shawls that, to a young girl, were so beautiful but also intimidating. And I remember dancing myself—noting how the body’s movements are fast but light—and thinking, “How can I make these garments fly?” The music would end, but I would still be dancing. My family would yell, “Stop, you have to win!” But at a young age, I never really stopped. I kept moving. I still do. The Fancy Shawl dance was and still is a common dance at Taos Pueblo, the place my family proudly calls home. However, I didn’t live on the Pueblo full-time to begin with. I grew up in the ’70s, in a rather atypical Native American household in Santa Fe, before moving to the Pueblo. The day after I was born, my mother brought me to her gallery in Santa Fe and placed me on some Navajo rugs. My father, Eddie Michaels, was an amazing beadworker. My mother, Juanita, and my stepfather, Frank Turley, were championship powwow dancers. Creative energy flowed through my family, and I was, from the very beginning, swaddled in Native art and design. My grandparents were a huge part of my upbringing, too. My grandfather, Ben Marcus, was a tribal leader who always reminded me to respect where I came from and who my people were. Up until the fifth grade, my mother and I would visit them often at Taos Pueblo. It was a far cry from my experiences in Santa Fe, where few other Native American kids attended classes at Cristo Rey Elementary School, right by Canyon Road. It was during this time that I watched many of my friends’ homes turned into Santa Fe souvenir or retail shops and other businesses. It was also when I struggled hard with dyslexia. Successfully completed school lessons were usually rewarded with a gold star taped by your name on the blackboard. Because of my inability to read or write well, I earned my stars by decorating the blackboard. As much difficulty as I had as a young student at Cristo Rey, that time period was pivotal to my creative development. It had less to do with reading and writing, however, and more to do with the adventurous walk to my mother’s gallery following the afternoon bell. I would pop in and out of galleries in the Canyon Road/Acequia Madre area, including collector Forrest Fenn’s gallery, where signs on the walls encouraged visitors to touch everything. At these galleries, I often found myself standing in front of works by members of the Taos Society of Artists, looking at their representations of Native regalia, and thinking, “I could sew beautiful garments like this—colorful, flowing, draping—and still make them my own!” It was the same entrepreneurial side of me that sewed powwow outfits: the little girl at Taos Pueblo who asked the photographers with the biggest lenses if they wanted to take a picture of me dancing— for money, of course. Visiting fabric stores on the Santa Fe Plaza became my routine. They didn’t carry much in the way of Native imagery, if they did at all, and finding contemporary Native designs was pretty much unheard of back then. It was my involvement with The Santa Fe Opera’s Pueblo Opera Program, founded in 1973 as a youth-outreach service, that made things click. I remember seeing amazing fabrics covered with Native imagery, but the motifs were all very literal. It was then that I knew I didn’t want to focus on stoiclooking Plains or Pueblo designs, which were the norm. I craved some sort of abstraction, thinking that if people saw me as contemporary, I would become contemporary. But I hadn’t quite figured out how to do that and still honor the strength and beauty of the Taos Pueblo people. I went on to Santa Fe High School, and then attended classes at the Institute of American Indian Arts (IAIA), before going to the Chicago Art Institute. IAIA was still finding its feet as a two-year college, but the inspiration its students and instructors gave me was invaluable. There was a certain amount of cultural liberty there that was hard to find elsewhere. I had so many worries about going away to art school and having to explain who I was, where I came from, and what exactly that all meant. But my uncle had some wise words for me before I went to Chicago. He said, “You don’t have to teach the world who you are as a Native American. It is not your responsibility. It’s your responsibility to get educated, and to let your respect for family, place, and tradition shine through your work.” That was the grand lightning bolt, the one thought that guided me as a designer with crystal-clear intention, and one that guides me fully to this very day: I gave myself permission to nurture what was truly mine while not selling out my culture—it wasn’t mine, or anyone else’s, to give away in the first place. In New Mexico, we embrace our varied cultures so completely that the act has the ability to heal old wounds. When you come from a place whose history is as rich as New Mexico’s is, you can’t deny it or hide from it. Who we are in relation to this place compels us to move forward, somewhat exposed, regardless of our personal circumstances. And that makes for some serious creative energy. It’s how you harness it that counts. Out of all the applications in the world, I thought, why did they pick mine? That was my reaction after winning a spot on season 11 of Project Runway. I was standing there, taking in a deep breath ahead of the season’s first challenge, the series’ first-ever “Teams Edition,” in which we had to use New York as our inspiration for creating our garments. Everyone was conversing as a team, but I decided I wasn’t going to listen. I was going to make a statement. It was time to take back my power, and I wanted powerful artists in my corner to help. I looked out at the New York skyline and asked myself, “Well, you’re here now; but where did you come from?” And the epiphany returned. And you’ll see the shadows of actual coyotes, going across the alfalfa field. And the pine trees make little noises, sudden and stealthy, as if they were walking about. And the place heaves with ghosts. But when one has got used to one’s own home-ghosts, be they never so many, they are like one’s own family, but nearer than the blood. I was almost eliminated from the show on more than one occasion, and I didn’t walk away from it with a glorious prize package. But I did come in second—and I left the show with my pride and my conviction as an artist, mother, Native American, and New Mexican intact. I didn’t back down, but I did take to heart the critiques the judges served up to me. To ignore them would have been to negate the perfect opportunity to grow from the experience, just as ignoring my roots as a Native American living in New Mexico might have negated my participation in the show. 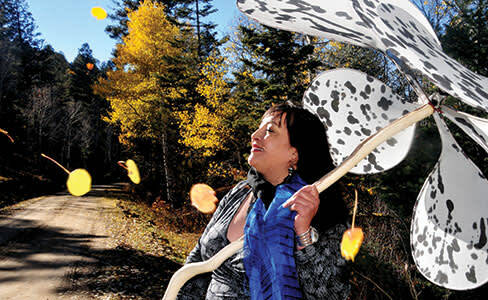 My given Pueblo name is Waterlily, and my first ready-to-wear collection is called PM (for Patricia Michaels) Waterlily. The collection is inspired by the importance of family, and by elements of the natural world. If there is one thing I have learned, it is that you have to love yourself to be able to grow. Picture a seed in the ground, surrounded by life-giving nutrients, and imagine what that seed first sees and feels as part of the bigger world around it. So many things determine whether or not that seedling makes it, including how it accepts its new surroundings.